The Official Hoverkart bundle by HOVERBOARD® is the ultimate addition to HOVERBOARD® Experience! 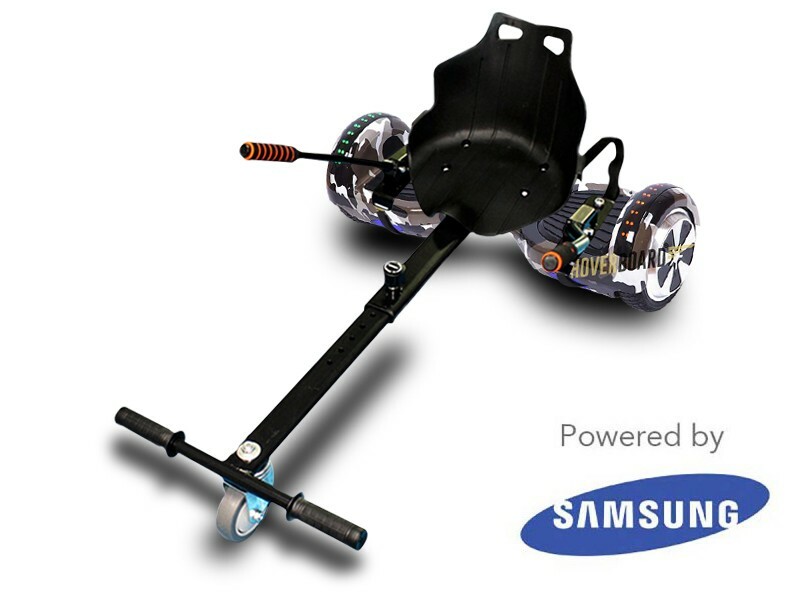 Converting your HOVERBOARD® to a Go-Kart has never been easier. Within minutes simply attach the Hoverkart by HOVERBOARD® to your Self balancing scooter by HOVERBOARD® and off you go! The Hoverkarts by HOVERBOARD® do indeed offer a more comfortable easier balancing ride.The Hoverkart by HOVERBOARD® also has a solid plastic seating which can provide comfort as well as support when using the HOVERBOARD®. Another big feature of the amazing Hoverkart by HOVERBOARD® design is the sensitive hand-operation leavers which puts you in full control of the balancing board by HOVERBOARD®! The Hoverkart bundle by HOVERBOARD® by will give you a garneted super smooth ride. The Hoverkart by HOVERBOARD® seating has an easy leaver to adjust the frame and seating position, so the Hoverkart bundle by HOVERBOARD® can become suitable for both children and adults, furthermore as well as great functionality the bucket chair style is a race car inspired design. Connect your phone to the built-in bluetooth speakers and cruise around on this model while listening to your favourite music. The perfect add on and gift for any HOVERBOARD® user. Furthermore, all our HOVERBOARD® products meet the applicable safety standards (UK) and are all certified and tested before they are shipped out. Please note that the HOVERBOARD® logo is not on the board and is only there for image copyright purposes. 100% safe UK Certified Balance Board by HOVERBOARD® that will last up to 2X longer and it fully complies with all UK safety regulations! Authentic Li-Ion Battery Cells (4400mAh) - almost double the power! It can be charged over 2000 times! Balance Board Size: 21.6" x 7.3" x 7.0"
In love with this product and Kart, not only does it look cool it functions well and with the kart it takes the experience to a whole new level. I would recommend anyone to grab a Fly plus with the kart for the best and cheapest experience. Brought one of these for my son and he is very happy with the product. I mean I couldn’t work it out for the life of me, but he seems to have got the drift and balance really quickly. Kids of today eh. But I am very happy with the product.